Don´t forget to purchase your entrance tickets for single admission tickets, family tickets, group tickets, school bookings, etc., on-line in advance and Save Money. Plus you can also purchase SEA LIFE Annual Passes and Merlin Annual Passes. When you click here or on the button right, it will take you through to Merlin Entertainments´ official Scottish SEA LIFE Sanctuary website for the Best Price Guarantee. Answer: Although it is preferable and quicker if the front of house staff have a printed copy of your ticket, you can still book your tickets online in advance and make savings if you bring along the booking reference number (or can show the email confirmation on a mobile device) and some ID that matches the booking name. The Front of House Staff can then check the records and allow entry from there. 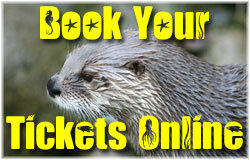 official Scottish SEA LIFE Sanctuary website for the Best Price Guarantee.